The Dow Jones Industrial Average ended last week at 17,128.55, which is 3.8% below the Janet Yellen high of 17,796.76. Even so, the Dow is up 5.2% so far in the fourth quarter, down 3.9% year-to-date, and 6.7% below its all-time high of 18,351.36 set on May 19. I guess the call to sell in May and go away was quite accurate in 2015. The Dow 30 ended last week below its five-week modified moving average at 17,418 with its 12x3x3 weekly slow stochastic reading declining to 81.06 down from 85.45 on Dec. 11 becoming less overbought. This reading will be declining below the overbought threshold next week and if the close on Christmas Eve is below 17,418 the weekly chart profile will be negative. The Dow is not yet in correction territory as that would have the average at least 10% below the all-time high. However, eight components are in bear market territory more than 20% below their multiyear or all-time highs. Here are the eight Dow components in bear market territory. Apple AAPL +0.00% closed Friday at $106.03, down 10.4% so far in December, down 3.9% so far in the fourth quarter and down 3.9% year-to-date. The stock has been below a “death cross” since Aug. 26, which warned that lower prices lie ahead. From the all-time high of $134.54 set on April 28 to Friday’s close shares of Apple are down 21.2%, solidly in bear market territory. Apple’s weekly chart is negative with the stock below its key weekly moving average of $114.30 indicating risk to the 200-week simple moving average now at $91.15. The weekly momentum reading is declined to 56.42 last week down from 66.67 on Dec. 11. American Express AXP +0.00% closed Friday at $67.87, down 5.3% so far in December, down 8.4% so far in the fourth quarter and down 27.1% year-to-date. 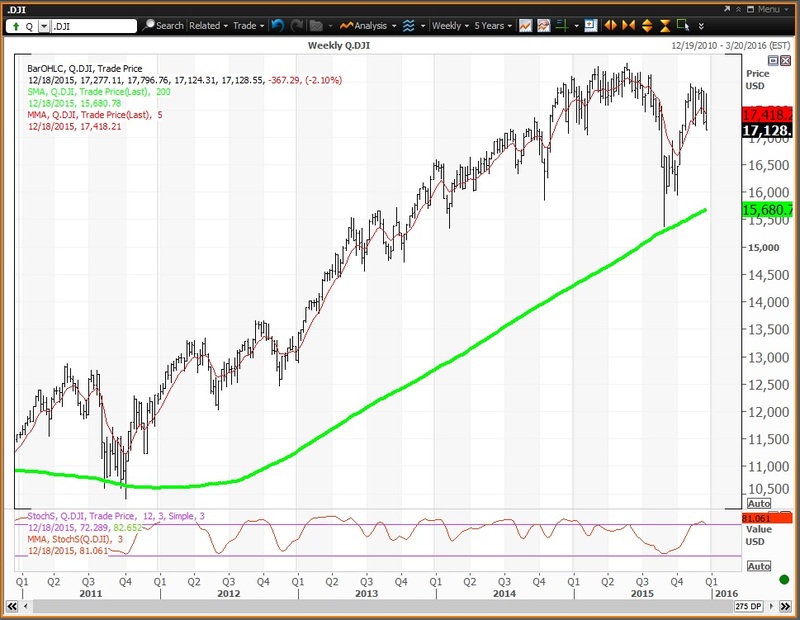 The stock has been below a death cross since Feb. 3, which warned that lower prices lie ahead. From the all-time high of $96.24 set on July 1, 2014 shares of AmEx are down 29.5%, significantly in bear market territory and a new 52-week low of $67.57 was set on Friday. American Expresses’ weekly chart is negative but oversold with the stock below its key weekly moving average of $71.38 and below its 200-week simple moving average of $75.08. The weekly momentum reading declined to 14.32 last week down from 18.34 on Dec. 11, becoming more oversold below the oversold threshold of 20.00.